I got to interview Stephen Uhle about his welded art for the April 2018 issue of Northwest Boomer and Senior News. Check out how this article appears on the Boomer and Senior website. Stephen Uhle’s art is really too heavy to travel, so he only sells at one art show each year. And although he’s never been trained in art, he sells nine out of 10 pieces he creates. But it’s not what you’d call “normal” art. Uhle’s Restart Art makes use of recycled automobile and heavy machinery parts, such as leaf springs, brake drums and bed springs. Unexpected materials such as small metal trampoline frames or bicycle wheels also become art in Uhle’s creative hands. The pieces are too heavy and, in many cases, too large to load up and take anywhere, so he sells only once a year at Art & the Vineyard, held on the Fourth of July weekend at Eugene’s Alton Baker Park. 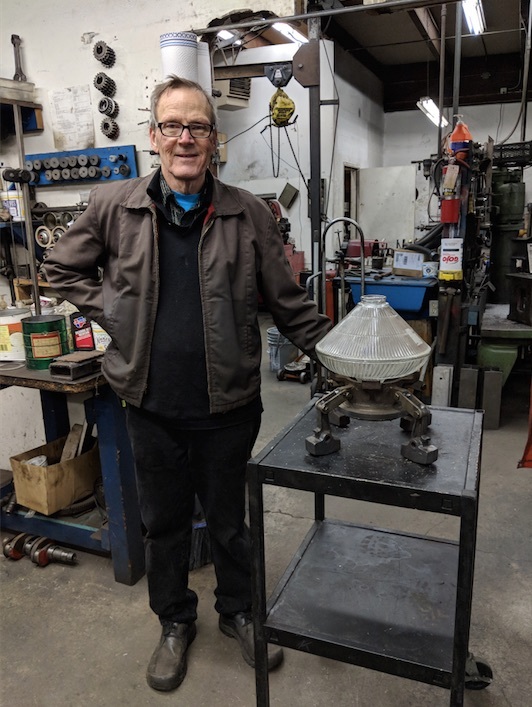 Many of his customers commission pieces, such as garden orbs or fire pits, and he envisions what they want out of the materials he has in his large shop. Uhle has shop equipment at a farm in Dexter, but does most of his work behind an auto parts store he opened more than 35 years ago in Eugene. He was born in Chicago, raised in California’s San Fernando Valley, and moved to Eugene in 1981. Early jobs at a car wash and tennis racket factory held little appeal. He liked making things out of used car parts. A 4-foot lamp made from Volkswagen parts holds two identical light shades from BRING, a store in Eugene that sells salvaged and surplus materials. The bottom shade holds a candle, which is then protected by the top shade. “People put things like this in the garden and it looks really cool,” Uhle says. There’s seemingly no limit to how these items can be reimagined with a creative eye like his. A large brake drum weighing 120 pounds, for instance, became a decorative flower pot. A different, smaller set of brake drums became a barbecue and smoker. His business card says simply “car part art,” but that doesn’t convey the full scope of what Uhle can create. He even made some pedal cars out of welded metal for a trip to Arizona’s Burning Man art festival a few years ago. The process primarily uses a technique called MIG or GMAW welding, which stands for metal inert gas welding or gas metal arc welding. MIG welders consist of a handle with a trigger controlling a wire feed. The wire is fed from a spool to the weld joint. Electricity produces heat, and melts the wire to form the bond between the two pieces of metal. Uhle didn’t even study welding until he’d been making art for a few years. As his shop grew and he pieced together more equipment, it expanded the things he could make. 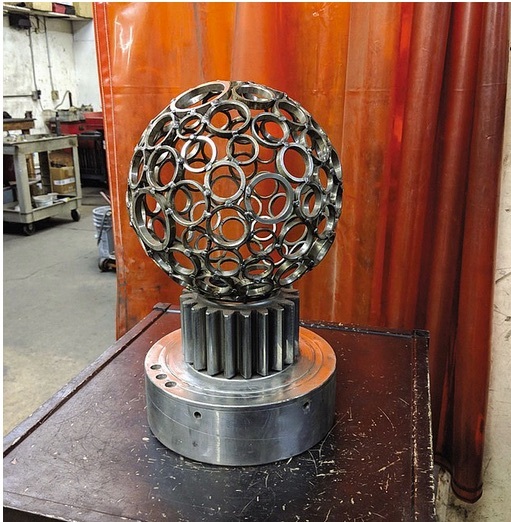 One of his favorites is a round object made of donut-shaped throwout bearings from an industrial transmission builder. One of his fire sculptures has a permanent home in downtown Eugene in front of New Zone Gallery and is lit up on First Friday Art Walk nights. When Uhle first considered starting his own shop, he looked around in the Los Angeles area. Even in the early 1980s, the monthly cost to rent a shop there would have covered his rent for an entire year in Eugene. Since he had inherited the Dexter property, he decided to make the move to the Eugene area and establish his shop here, buying equipment a little at a time. His pieces sell for affordable prices — the 4-foot lamp sells for $135, while larger garden lamps might sell for $200. Even though Uhle doesn’t transport his art out of the area, he’s open to new commissions. He especially appreciates being asked to do a piece that he hasn’t done before, or use a new material. His customers usually have ideas about what they want when they approach him about a commission, and Uhle enjoys working collaboratively with the customer to bring the idea to life.